Imperfect specimens (missing antennae and/or minor to moderate wing nips/folds). These strikingly beautiful, large moths are probably the most colorful insect. Their common name is the Madagascan Sunset Moth. Some specimens contain every color of the rainbow. 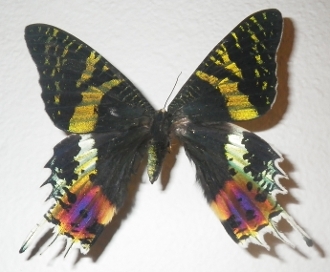 Urania ripheus is now called Chrysiridia ripheus.